This attractive holiday park offers a choice of accommodations. There are two types of four-person bungalows. One, NL-6002-01, has standard furnishing with a fireplace. 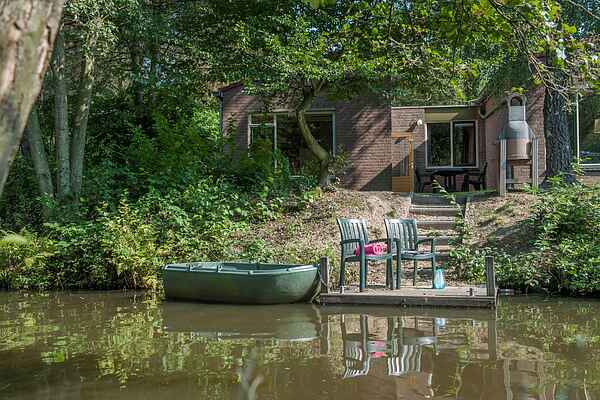 The other accommodation, NL-6002-04, also has a fireplace and has a Playstation-2 and a rowing boat. These bungalows are by a canal leading to a lake. If you prefer more space, there is an attached six-person bungalow, NL-6002-02, and a detached six-person bungalow, NL-6002-05. Suitable accommodations for groups are also available at this holiday park. These accommodations have recently been restyled. The 10-pers. family villa (NL-6002-23), the 14-pers. family villa (NL-6002-24) and the 24-person accommodation (NL-6002-25) are detached and fully equipped. All accommodation features a private terrace with outdoor furniture.